Since 1991 Kenneth Boehm Motor Car Company has been selling affordable Honda and Toyota automobiles with a standard of quality that was believed to be impossible by our competitors. Today that same standard is still the way we do business and through the years has resulted in an almost 100% “word of mouth” dealership. KBMC, Inc. strives for perfection and here are a few reasons why. 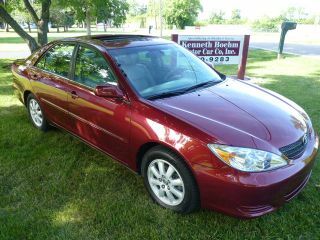 We specialize in two specific automobiles - Honda and Toyota. Why? These two manufacturers produce the highest quality mass produced automobile in the world today. In addition, the reliability over time and extended mileage is vastly ahead of anything else available at a similar price. Selling these specific makes insures our customers that their vehicle will perform reliably and economically long after the sale. We are technically seasoned in Honda and Toyota and have a high understanding of the product we sell. Any mechanical or product specific questions will be answered with accuracy and integrity. Our inventory is sourced from PRIVATE OWNERS in the Cincinnati / northern Kentucky / Dayton and Columbus areas. We strive for single owner, consistently maintained, low mileage automobiles that have not been wrecked or painted on. WE DO NOT SOURCE OUR CARS FROM AUCTIONS, WHOLESALERS OR OTHER DEALERS - ONLY LOCAL PRIVATE OWNERS WHO CAN SUBSTANTIATE THEIR HISTORY!!! The most distinguishable and significant attribute of our inventory is the method in which it is prepared. Each vehicle is inspected bumper to bumper to identify any abnormal running issues, non-functional or faulty controls / accessories and to insure the vehicle’s maintenance is completely up to date. The format of this inspection is a quality checklist that maps a plan for inspection and reflects any corrective action performed by the technician to remedy any mechanical issues. In addition, all maintenance is performed per the manufacturer’s recommendation for the vehicle’s particular mileage / age. WE ARE 100% CONFIDENT IN THE PREPARATION OF OUR VEHICLES AND ENCOURAGE YOU TO HAVE AN INDEPENDENT TECHNICIAN INSPECT ANY OF OUR CARS FOR YOU. Our inventory varies in price with most vehicles priced between $5,000 to $10,000. We provide a 30 day/1000 mile limited warranty for every vehicle sold. We offer our customers professional maintenance & service after the sale. If your expectations are not fulfilled shopping private owners and other dealers, stop in to KBMC, Inc. and view our vehicles. You will not find our level of quality and perfection anywhere in the tri-state. We know you want safety, value, reliability and respectable aesthetics when shopping for a car. At KBMC, we deliver all these and much more. © 2017 Kenneth Boehm Motor Car Co., Inc.